This pair of andirons in the neoclassical style are made of brass and wrought iron. They are French, circa 1940. 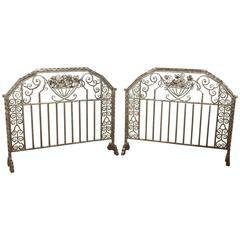 This pair of wrought iron andirons are French, from the 1970s. They are in the style of Garouste et Bonetti. Pair of iron and brass chenets or andirons, 19th century. Pair of polished iron and brass chenets or andirons, 19th century.